Proponents suggest that the mystery of marketing fades in the face of data; that the "I know I'm wasting half my marketing, I just don't know which half" quandary is resolved. That's true. For executives with financial and engineering backgrounds it offers insights into what had traditionally been a budget black hole. But the ugly truth of industrial content marketing is that it doesn't always work as easily as advertised. (That's part of Dan Lyons' message in Disrupted. It's also the subject of a recent, worthwhile article from Computan's Sajeel Qureshi that provides a realistic view of what's involved.) In fact many companies invest substantial resources without substantially superior results to their traditional B2B marketing (magazine ads, trade shows and cold calling) approach. It turns out that it's the scope and depth of strategy - but even more than the Xs & Os, the vision which informs the strategy creation. And the good news is that there are two diagnostics which provide predictors of the likely success of an industrial content marketing program. Successful industrial content marketing will require that executive management approach the project with a growth mindset and articulate that in a description which is shared and frequently referenced and repeated to the company. But that's not enough - because they'll delegate much of the work as well. 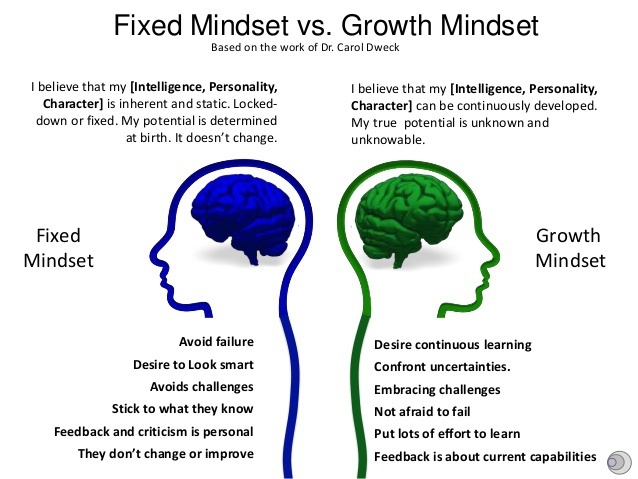 So leaders in the marketing team and outside advisors must also have a growth mindset. Hiring requirements must reflect this need - for instance, why in the world would you hire an inside sales rep (who will have to be conversant in and comfortable with digital connections with prospects) who has a lame LinkedIn profile? And this is one huge reason why the industrial marketing technology infrastructure has to be moved to the control of the revenue growth team. Let me duck around the corner to dodge what might be thrown before I say this......IT almost always has a fixed mindset which hobbles otherwise solid industrial marketing efforts. One final note on mindset - it's not only critical to the way a company executes its marketing. It's obviously relevant to the dialog with buyers too. Some will be looking for the traditional "way we've always done it" sort of solutions while others will be looking for opportunities to redefine and improve operations. And buying teams will likely combine perspectives. So marketing needs to speak to both. Borrowing (with permission!) 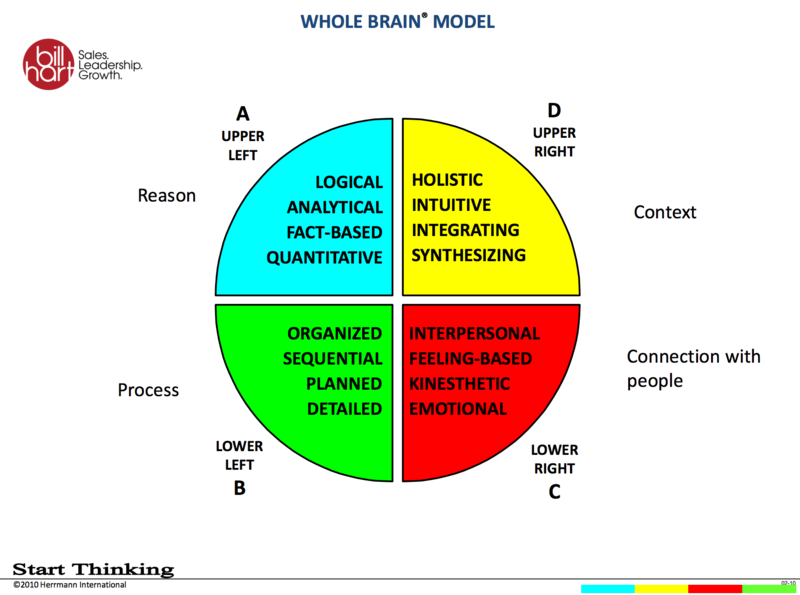 from Whole Brain consultant Bill Hart's work, the premise of the model is that people tend to view, consider and react to situations with certain predilections. That, unsurprisingly, impacts the way they buy - or perhaps more aptly, WHAT they are buying. Like mindset, this is both a diagnostic for a company's ability to develop and execute great B2B marketing and a tool to optimize it. Let's start with the former. Most industrial manufacturers tend to live in the lower left corner. They're masters of repeatable process - so they naturally approach digital marketing as a list of activities. "We'll blog two times/week and we'll tweet three times/day" for instance. But blog and tweet about what? To whom? With what goal? Success requires comfort with a multi-variable process (there are lots of moving pieces and changing any one changes others) and the ability to see the big picture. How the website must evolve; why you blog (for subscribers and new prospects); the role of social media (to foster conversation); and what issues worry your buyers (often not the ones upon which you focus) are examples. And the pace of change in buyer behaviors, technologies and tools is so rapid that the digital marketing program itself must be run in a very agile way. That's going to be uncomfortable for those who need to embrace a clear and well defined plan before they start something - they'll never have that comfort if they're managing their digital marketing effectively. Perhaps most importantly, CEOs and presidents have to reconcile themselves to the idea that buyer expectations are no longer compatible with a traditional linear org chart that starts with PR and runs through marketing to sales to customer service. Instead it's now a single revenue growth continuum that requires organizational changes including staffing, resourcing and compensation. As with mindset, executive management, marketing and advisory teams must be able to visualize the "big picture." Of course routine, ongoing execution requires a logical plan, empathetic content and rigorous attention to detail. But absent the context, efforts will never achieve more than mediocrity. This difference in perspectives often surfaces in other areas. Buying cycle is one. Is it linear the way it's drawn on a whiteboard? No. But that's the way companies manage it. Margins are another. If you market and sell your products & services as a safe choice that's a detailed series of planned steps, then it stands to reason that your price can be negotiated quite precisely. That leads to discounting to win deals, and contrasts with the results when companies position their solutions in a bigger context for buyers. This impacts marketing automation and lead nurturing. Does the process embrace the fact that different buyers view problems and solutions differently, in fact probably evolving throughout their buying process? Or does it follow the unrealistic linear tradition? With a growth mindset, companies can develop marketing automation as a tool which improves the buyer experience AND increases sales success. This free guide outlines how to do that! It also impacts the range of content and the synthesis of content into campaigns; the approach to guest posting and other types of content distribution & promotion; and to the interaction between sales and marketing. 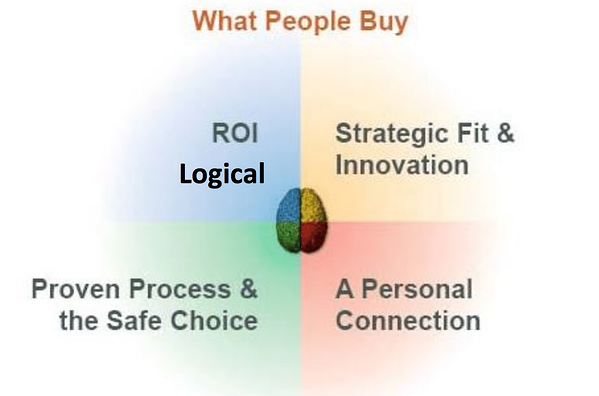 Mike Hamilton tackled this recently in an article on using a WholeBrain approach to running sales meetings - but the premise is the same when it comes to creating content to satisfy buyers in different quadrants. BUT, you say, this really over complicates things. We're doing traditional content marketing and it's helping us. That's great, but..... Aside from the opportunity cost of missed deals (vs. lost) that you're probably already paying without even realizing it, it won't continue to work long term. Mediocre, formulaic practice of content marketing is still working in industrial industries. It may take a bit longer and bigger effort to succeed than three years ago, but relatively few companies are really doing it well and consistently. That means digital marketing which is quite average by broad standards remains pretty effective for industrial marketing. A couple recent articles from Seth Godin illustrate why. First on uniqueness. One of the most common objections I hear from B2B company leadership is internet based industrial marketing can't work for them because their product is so different and so much more special. They can only convey that unique value in person. Well....the buyers may grant you that in person opportunity once you've earned it. And they're screening options using the same tool that they used to understand their problem and research the options they have. Would you like to be screened in....or simply overlooked? As Jason Hall of Slow Roll Detroit recently suggested on the DailyFuel (@DailyFuel) video blog, a child-like open-mindedness may help. There's been lots written about quality content. Early in the content marketing land grab that meant written by a human vs. SEO gibberish. Later it meant readable. More recently it's become a series of list articles (Top X of X) which are distilled from guides and webinars. That's the type of robot work to which Godin refers. Not only will the employment picture change for manufacturers and their customers, but the vanilla content won't be discernible amidst the noise. To be successful companies will have to stake out areas of authority - and that will mean senior management being willing to take some risks. And that brings us back to the diagnostics. They'll need to understand how various types of buyers assess and solve their problem (vs. the way they've defined it internally.) And they'll need to experiment and improve with every article and offer. They'll need a growth mindset, and an industrial content marketing program which synthesizes many different pieces. Still hanging out in the upper left quadrant? Wondering about ROI? This guide to the finance of inbound marketing for manufacturers will outline the cost and return - and even swing into the upper right to explore other larger benefits to your enterprise valuation.